Jagga Jasoos starring Ranbir Kapoor and Katrina Kaif opened on a decent note on Friday earning Rs 8.57 crore. After its weekend collection stood at Rs 33.22 crore things look good for Anurag Basu directorial. 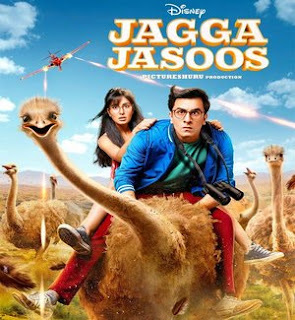 Jagga Jasoos film Released in over 1800+ screens in India and 610+ screens in overseas. Storyline:- Jagga Jasoos is about a young detective Jagga (Ranbir Kapoor), who is in search of his long time missing father (Saswata Chatterjee). During his journey, he is accompanied by a journalist named Shruti (Katrina Kaif). Since then, the story gets more adventurous and funny as well. The story of the film is told through chapters from a book depicting the various cases solved by Jagga. (1) Jagga Jasoos is the la la land of Bollywood. This genre is being tied for the first time in India. For quintessential Indian audience demanding item songs, fights and heroism, it's way ahead of time. Ranbir Kapoor is an absolute superstar.